Below are two commercially-available systems that we have reviewed. 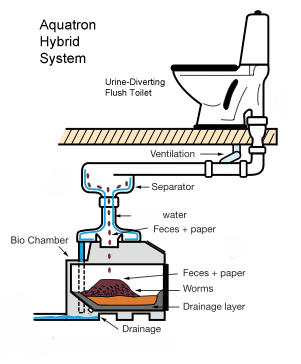 An Aquatron hybrid toilet system combines a UD flush toilet with a large bin or batch composting system. The urine is diverted at the commode to a storage tank, while the solids (feces and paper) are flushed, just as they are in regular toilets. Here’s the difference: the Aquatron Separator separates solids from the flush water and directs them into a composting chamber. No electricity is needed for this process. The remaining blackwater is combined with the household’s graywater and goes into a septic tank. The Aquatron system is designed to be used with the rotating Carousel, but where space allows, any large-bin or batch composting system may be used. The composting component of this system requires a fan that—depending on the composter—uses 5 to 30 watts per hour. 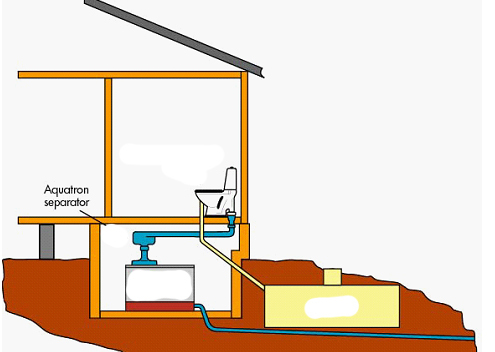 After going through the Separator, the flush water still contains some nutrients that enter the septic tank, and is considered to be blackwater because it has been in contact with feces. Often combined with the Aquatron, the Dubbletten UD Toilet has three flushing options: one for the urine bowl and two for the solids section of the toilet. To flush urine, water consumption is 0-0.2 cups. Solids can be flushed with either a small volume or large volume flush, using up to one gallon of water. 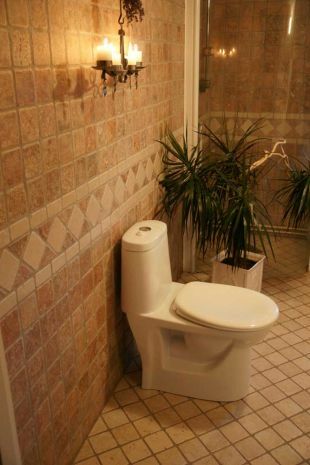 Compared to normal flush toilets, this system reduces water consumption by 80%. The separator and compost components of the Aquatron hybrid composting system are approved in Massachusetts, but the urine-diverting component is under review; thus the Aquatron Hybrid is not yet approved in Massachusetts. Periodically checking the Separator for blockages, which may be done remotely with a small camera. Periodically removing urine from the storage tank. A sensor may warn the user or maintenance service when pumping is required.